This pile of peeled off stickers at the end of the day shows how busy the Plattsburgh Public Library has been lately. Books and other materials have been flying in and out. The library has seen a jump in usage, due in part to the bad economy, people trying to save money. But ironically the same bad economy might force cuts in the library’s budget. Remember the Great Recession with President Ronald Reagan? Homeless people living in cars and tents, clustered into Reagan Ranches. I spent a lot of time at the public library back then. Out of work. No jobs to be found. Over the years I’ve read many books free of charge, thanks to the library. One that sticks in my mind is Journey To Nowhere: The Saga of the New Underclass (1985) by writer Dale Maharidge and photographer Michael Williamson. Traveling across the country in those dark days of the Reagan recession, they documented in words and pictures how well the “trickle-down” economy was working. The term trickle-down sounds more appropriate for a urinal, not the US economy. Most people don’t want to be trickled on – or tricked. Don’t forget: skateboarders have priority over motor vehicles at the Marion Street Skateboard Park. When skateboarders are using that street, all drivers must use alternate routes. Do not drive down Marion if you see skateboarders. Also, adjoining streets – Clinton, Protection, and Brinkerhoff – are included in the park area. Skateboarders are allowed to ignore all traffic laws. They may travel the wrong way on a one-way street or fly through a stop sign. There are no regular hours posted. Skateboarders decide randomly what hours they will take over the streets. Also, they aren’t responsible for any property damage they cause to any vehicles or buildings in the area. If your parked car is dented or scratched, tough. If you don’t like the edge of your walls or buildings ground down, then relocate your church, arts center, or business. Owners who scoop up their dogs' droppings and place them in specially marked bins on Petah Tikva's streets will be eligible for rewards of pet food coupons and dog toys. That’s how far one community will go to maintain clean streets. And while cash-strapped Plattsburgh can’t afford DNA analysis of dogshit, it has been observed that while there are a lot of dogs in the city, not many of them have been registered. Registration fees could help generate money for enforcement and cleanup. If any DNA analysis is needed, it should be directed at negligent dog-owners who let Fido’s feces lie around wherever it drops. I suspect a common link could be found among all such owners: a rudeness gene. Gee, doesn’t that editor know about WEXPO – Plattsburgh’s weed expo? The property owner is sharing his love of wild plant life with the rest of us. Why assume that he’s indifferent to the overall look of downtown Plattsburgh? Six days after the PR editorial not one weed has been clipped. Ergo, the property owner is indeed maintaining a weed garden as an artistic statement. Of course, one could assume that the city is once again lax in keeping up a good impression. Or PR editorials have as much influence as a flea fart in a hurricane. But either assumption couldn’t possibly be true, could it? In the same PR editorial skateboarders were chastised for reckless actions while gliding along in the street, making risky maneuvers with car traffic. Doesn’t the Press-Republican know that skateboarders rule the road? Especially the intersection of Protection Avenue and Marion Street? The PR editors should get out and walk around more often. For too long they’ve been comfortably secluded in their graystone office/fortress. Creating a book is a long, lonely trek. Yesterday evening at the North Cultural Center for the Arts, Elle explained how an interest in taking leisurely walks led her to “rambling” throughout Great Britain. She realized those experiences could be the basis for a book. During her PowerPoint presentation, she said that Britain is aware how walking trails impact local economies. Bed and breakfast inns, pubs, and stores benefit from visitors who arrive into town not by car but by foot. Her stunning images of the English countryside showed how most trails are well marked and maintained. Hardly any litter, she noted, was found during her ramblings. Demonstrating the importance placed upon walking trails, one image showed a long pedestrian bridge that had been installed at considerable expense. Other images recorded the farm animals seen along the way, especially one friendly sheep that posed for the camera. Elle turned to self-publishing to make sure her book would have the right format and style. She knew she needed the assistance of specialists. Unlike some self-publishers who do all or most of the work, wearing different hats at the same time, Elle delegated parts of the process to others: editing, web site creation, art, publicity, etc. As much as possible she used the services of local people. Throughout her writing career she appreciated the support of others in the community. It made the long, lonely trek much easier. Elle is now traveling around the North Country to promote her book and also to express her thanks to those who made her dream a reality. Information about upcoming book signings and presentations can be found at www.tenderfootpress.com . Her book is available at the NCCCA, 30 Brinkerhoff Street, Plattsburgh. Finally: the City of Plattsburgh has recognized my citizen journalism and has decided to honor me. The nickname for the Burgh is no longer The Lake City: it is now The Luke City. But if you look at the sign as a whole, it does look kinda ratty; time to fix it up. Notice that one decorative post globe is missing and the surface is pitted. Remember: first impressions count. And I don’t what anyone entering The Luke City to think that either the Burgh – and more importantly, me – is ratty-looking. It’s simply a matter of spending a penny now for a fix up or a dollar later to replace the sign after it rots and falls down. A chilly Sunday evening in September. People gather for a candlelight peace vigil at MacDonough Monument in downtown Plattsburgh. Hopes are expressed for the end to war. The names of the fallen are read and honored. Four decades. Some leaders didn’t learn from history; now we’re all doomed to repeat it. The Vietnam War. During my teenage years it dragged on and on, always in the background. Winning hearts and minds. The light at the end of the tunnel. Peace is at hand. To save the village we had to destroy it. Vietnam should have taught this country’s leaders two important lessons: 1] Don’t lie your way into war. 2] Don’t wage a war you can’t win. But memories fade. The same one-liners are brought back as if new. If we quit now, then all the lives that had been sacrificed so far will be wasted. If we don’t fight them there, we’ll have to fight them here. The big put-down back in the Sixties was “peacenik.” It implied someone with no backbone, an impractical idealistic who thought that just by radiating thoughts of love all wars would stop. I’ve never been a “peacenik.” But I’ve never been an “America Right Or Wrong” patriot either -- especially when certain politicians put their own self-interests above their country. Of course, war profits are easy to accept when someone else’s son or daughter is on the front line. Forty years later and the US is stuck with not one but two conflicts it can’t win militarily. Forty years later and candlelight peace vigils are still being held. While war drags on, fading at times into the background, some of our neighbors remind us that it’s still there. The watch must be kept. Maybe someday lessons will be learned. Taxpayer dollars well spent: a new stairway obstructed at the top end by guardrails. How convenient. And so pragmatic. People sometimes wonder what the hell I’m doing with my camera. There’s an old-fashioned diner in downtown Auburn, NY. The inside of Hunter’s has all sorts of reflective chrome. Most people probably think all of the chrome is just a uniform dull gray. But with my eye I know better. I take the shot and ignore any puzzled stares. I see the art being overlooked in the diner. There’s a story lead almost sitting on your doorstep. Clue: it deals with a sanitary problem that for too long has been ignored by the City of Plattsburgh. Or at least you could put down some unsold copies of your newspaper. Artist-sculptor John Meighen will transform the NCCCA arts center into an otherworldly scene this weekend with his collection of outre masks worn by ET-thin manikins. The reception will be held Saturday, Sept. 13th, from 5 to 7 PM, at 30 Brinkerhoff Street. The exhibition will run until October 18th. For more details, call the North Country Cultural Center for the Arts at 563-1604. The men’s room toilet was occupied for some time. 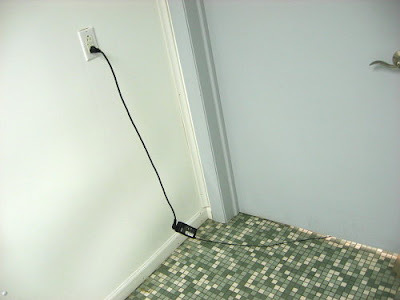 A power cord was stretched under the door, probably leading to a laptop computer. What was going on? A diarrheic blogger? 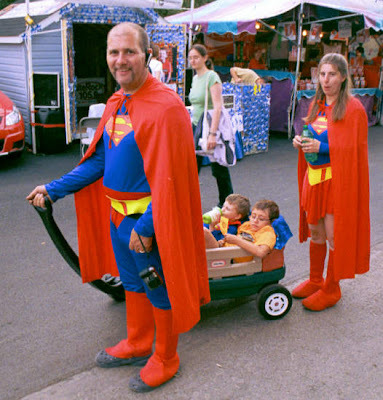 The New York State Fair. 374 acres. Thousands of visitors each day. Lots of animals on the grounds. For the most part, it’s pretty clean, especially for a temporary small city. So what greets me as soon as I return to Plattsburgh, sitting right outside where I live?